Just as it’s intriguing to wonder how Iain M Banks’s career might have panned out had he first found fame for the Culture rather than as a literary novelist, Stephen King’s Dark Tower novels offer an interesting question. Specifically, would readers be so interested if King hadn’t first written Carrie ? One answer is to say yes, King is such a fine storyteller that of course he would have broken through. But a lingering doubt remains because, even from the perspective of an era of high-concept mash-ups such as Cowboys & Aliens , the Dark Tower books are just so downright odd in the way they meld together elements of quest-narrative fantasy, the (spaghetti) Western, SF and horror. These are novels that aim for a mass readership, yet appear to have been written by a man approaching the mainstream from a tangent. What is consistent with King’s more obviously commercial work is the style and tone. Like John Steinbeck, he’s an unfussy writer whose voice is rooted equally in the rhythms of everyday speech and the mythic made manifest in everyday life. Indeed, reading King, you often sense the presence of the dustbowl America of The Grapes Of Wrath . That’s certainly true of The Wind Through The Keyhole , filled as much of it is with near-desolate rural communities and families facing troubles (which makes the book sound far less fun than it is). 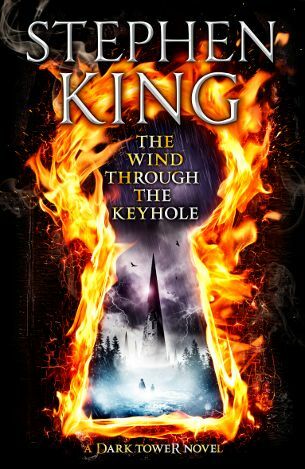 Chronologically, it’s set between the fourth and fifth volumes of the Dark Tower sequence, Wizard And Glass and Wolves Of The Calla , yet as King’s foreword makes clear, it can still be read as a standalone novel. However, you can be too young for certain stories, and for all that a recurring theme in Keyhole is the callow learning about the world, this isn’t kids’ stuff. Rather, this is a book that finds King exploring fairytales and other familiar stories as a way, you’d guess, to connect with the power of narratives that have roots deep in our shared culture. In the third tale, for example, we’re offered a journey into an eldritch forest, a Grimm place. Other touchpoints include Narnia and Arthurian myth. Even individual characters straddle mythologies: supernatural tax gatherer the Covenant Man variously recalls both the trickster Green Man and the related archetype of the wandering Devil in search of souls to snag. Believe us, he’ll haunt your dreams. Which is of course what so often happens when you encounter the characters from a King novel. That’s not to say Keyhole is up there with his very best work, but even a comparatively minor King novel has a sparse elegance that most novelists never achieve in a whole career. Put it down to that insistent, economical and wholly distinctive authorial voice. Read more features, news stories and reviews to do with Stephen King .